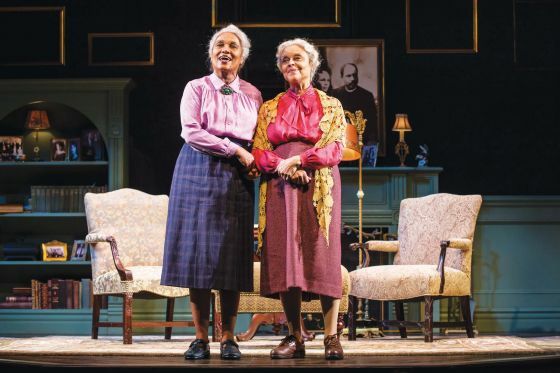 My mother always said that there is a lot we can learn from our elders, and an evening spent with “the Delany Sisters,” a pair of centenarians whose life story is the subject of Having Our Say: The Delany Sisters’ First 100 Years, now at the Goodman Theatre, certainly illustrates the point. Ella Joyce and Marie Thomas play Bessie and Sadie Delany, respectively, two sisters with extended family memories all the way back to 1812 who told of their century as black women in America in interviews with Amy Hill Hearth in the early 90s for a book that was transformed into a play by Emily Mann shortly thereafter. Framed as the gregarious sisters visiting with a new friend (Bessie speaks of how bored she gets talking to people she’s known forever, at least the ones who are still alive), the play spends time with them just chatting in their Mount Vernon living room as well as preparing a meal in their kitchen: normal activities that, we can easily imagine, fill their days. But it is the substance of the conversation that attracted director Chuck Smith to the project, the stories of life in the post-Civil War days and the memories of life in the Jazz Age and under Jim Crow. Though these women were, by their own admission, exceptionally lucky for African Americans (“We just call ourselves Americans,” Bessie says) in the 20th Century, spending a couple of hours with the Delanys is like getting a lesson on black history from the most personal teachers in the world. These were women who knew W.E.B DuBois, women who met Eleanor Roosevelt, women who have memories of the likes of Cab Calloway and other famous musicians. They are also women who lived through some of the ugliest scenes in American history, including the era in which “rebbies” (short for “rebels,” used as a pejorative term for white racists) would hang black people “just for fun.” Bessie even tells the story of coming very close to being lynched herself. It’s a remarkable play about remarkable people. Pushing the value of working hard and getting an education, the women recount their experiences as the only black woman at Columbia University dental school (Bessie) or the first black teacher in New York Public Schools (Sadie) and how they learned and used the lessons their father instilled within them. They also recount the darker side of living so long: they survived not only their parents but their ten brothers and sisters and pretty much all of their friends. But the memories they kept alive could bring it all back in a millisecond. At one point admitted “mother’s girl” Sadie is reduced to tears recounting her mother’s death despite the fact that it was over thirty years in the past. And Bessie, the quick-tempered and judgmental sister who has “learned to forgive but not to forget,” gets spurred to anger by some of the events she has witnessed in a hundred years of living. Joyce and Thomas are perfect as the sisters. Their every interaction renders the idea that they have known each other for a century entirely believable. They finish each other’s sentences. They pass narratives off so easily that you know they have told these stories a billion times. They instinctively comfort each other as they need it. But these are not merely interchangeable parts. 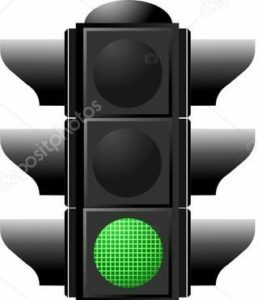 Joyce, as Bessie, is taller and built solidly. She moves and speaks deliberately and slowly, whereas the wiry Thomas throws her whole body into her movement and all of her energy into her narratives. Both women are also capable of great humor; there is a lot of laughter in this show, much of it at their own expense but some of it very topical. (It’s amazing how much response you can get out of a good Dan Quayle joke thirty years later.) Smith has helped these fine performers transform themselves into these siblings through nuance both subtle (each practically knows what the other needs before she needs it) and overt (their different approaches to such tasks as making dinner and their distinct physicalities). They are both remarkable performances. Remarkable too is Linda Buchanan’s set, which takes full advantage of the Goodman’s turntable and features picture frames and projected images by Mike Tutaj of the sisters’ family photos and films and stills from the eras of which they speak. All aspects of this show shine, but that doesn’t go far enough. Smith has made the show into an entirely personal experience, far more like visiting with a couple of favorite aunts than watching a play at all. From the start, when the sisters invite us into their home and their lives, to the end, when they say good night to us as if we were good friends, Smith has crafted a remarkably intimate production on the Albert stage. The two women led fulfilling, impressive lives, and in Having Our Say we get to share their century of life, if only for two hours. My mother would say that it’s two hours very well spent, and I’d agree with her. If you’ve never had the pleasure of getting to know the Delanys, don’t miss this opportunity. Having Our Say is now playing at Goodman Theatre, 170 N Dearborn, Chicago, until June 19. Performance times vary; check the website at Goodman Theatre. Find more information about current plays on our Current Shows page and at theatreinchicago.com.